What is the story on the Howlers logo? Harvest Moon represents the stark beauty of the the Prairies and in turn also the game of rugby and life itself. Traditional Prairie Grain Elevator represents the co-operative spirit that prevailed amongst our early pioneers that survived and then prospered in such a hostile environment. This co- operative spirit also pertains to the often tough and hostile game of rugby were it also takes a co-operative team effort to succeed. This of course also pertains to everyday life it self. The Coyote is a prairie animal that lives in a pack but hunts singularly (contrary to wolves that live and hunt in a pack)..Rugby of course is the same. Also in rugby, we work and play together as team on and off the pitch. We also each have individual duties and responsibilities as part of that that team. In life we also live in a community/family but we have individual responsibilities to be part of these units .-- "Individual commitment to a group effort that is what makes a team work, a company work, a society work, a civilization work.” Vince Lombardi (late great Green Bay Packer coach). What is the significance of the Howlers colours? Orange - color the Prairies' harvest moon. Do the Howlers cover their players costs? Quite simply, no we do not. The players are expected to pay their own travel, accommodation and meals. 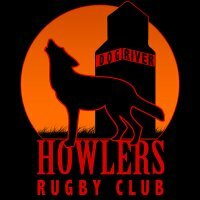 The Howlers undertake fund raising to offset the players expenses. However, the majority of Howler fund raising goes directly to worthy causes. Do you have to be Canadian to be a Howler? Priority is given to players that are born or raised in Canada. We have had players from Chile, New Zealand and other countries play for the Howlers. How do you become a Howler? It is the responsibility of the Howler players to nominate candidate-players that exemplify the qualities of leadership, teamwork, selflessness and community spirit for consideration for the team. The Howlers play in elite level competitions so players must possess the traits referenced and also be an accomplished rugby player. Why do the Howlers say that Rugby is more than a game, it is a way of life? Baron C. Hanson, is the principal and lead consultant of RedBaron Consulting, based in Charleston, S.C. Follow the firm on Twitter at @redbaronUSA. The Wall Street Journal recently featured the magnanimous headline “Rugby Star Gets General Motors Out of a Scrum.” This must-read article explains how CFO Christopher Liddell prepared a $23 billion offering spanning three continents, 35 underwriting banks and 90 promotional meetings to satisfy GM’s largest shareholder — the U.S. government. I am not surprised. Liddell is a lifelong rugby player. Liddell left the CFO desk at Microsoft in January of 2010 to turnaround the ailing Detroit automaker. A distinctive quote from the WSJ article invites the thesis: “One of the disciplines [Liddell] learned as a rugby player was the level of preparation you need to accomplish something great,” explains James Lee, vice chairman of underwriter J.P. Morgan Chase. Hailing from New Zealand, Liddell holds a degree in engineering from the University of Auckland and a master of philosophy from Oxford. Liddell also completed the Ironman and practices yoga. Most notably, Liddell served as both governor of the New Zealand Sports Foundation and director of the New Zealand Rugby Union. In our experience turning around small and middle-market companies, CEOs and HR recruiters are placing more emphasis on proven experience and durable character when hiring or partnering top talent –– beyond degrees and resumes alone. Workforce cultures today require staff at all levels to “man-up” and face the future with less trepidation and more acceleration. The athletic culture and character of rugby offers a fascinating lens to consider. Adapted entrepreneurially from soccer in England in 1823, the sport’s popularity and gladiator-like training benefits spread like wildfire via military, diplomatic and elite private school colonialism. Rugby did not begin gaining critical mass in America until the 1970s around the time “the try heard round the world” was televised stateside. Today most U.S. cities and universities have rugby teams. Nearly the same field design as gridiron football, rugby is a non-stop battle for possession of a live ball, which can never be passed or fumbled forward. The only way to advance the rugby ball is to run or kick forward, passing laterally. Once tackled to the ground, players must release the ball so others on their feet can legally play on. The live ball designates a moving line of scrimmage parallel to each goal line, which helps govern the match for players and spectators. RUGBY IS DIVERSE: The sport welcomes international men and women of all ages, backgrounds and races –– especially at top MBA, law and military school teams. Contrary to popular belief, there is a position for every body style on a rugby team. Similar to the way corporate cultures must diversify globally, rugby brings ex-patriots and natives together to break down workplace barriers and speak a new athletic language. RUGBY IS EXTREMELY CHALLENGING: In today’s macro and micro workplaces, sheepishness and indecision financially set economies back millions by the minute. Beyond the obvious physical strength and stamina required, the mental intensity of rugby trains players to fearlessly focus under extreme pressure and welcome challenge. RUGBY REQUIRES SELF-CONTROL: The rules of rugby are somewhat complex by design. Lack of composure and discipline in the trenches can result in possession or points awarded to your opponent. The mental and physical control required is considerable. At work, fatigue late in the game can be expensive. RUGBY REQUIRES THE WEARING OF MANY HATS: Rugby has no time-outs, coaches calling in plays or rested teams coming off/on/off the field. Offense, defense and everything in between are 100% delegated. The fifteen players (plus 3-4 injury reserves) that take the field must perform, communicate and think for themselves as a unit for eighty raucous minutes. RUGBY PLAYERS ARE UNAFRAID OF TACKLING ANY OPPORTUNITY: When Chris Liddell considered leaving Microsoft for the GM position, 50% of the people he consulted first thought he was crazy. Liddell states: “Obviously a risky career move, taking the ailing automaker from going through bankruptcy towards one of the most interesting turnarounds of all time? You can’t ask for a better opportunity than that” (WSJ). RUGBY PLAYERS CANNOT DEPEND ON BLOCKERS: Unlike American football, blocking is illegal in rugby. There are no players ahead of you clearing opponents out of the way. Rugby players must go mano y mano against every opponent, looking and listening for teammates behind them. It’s every rugby player’s job to lead their team into new space, pass the ball effectively under fire, then recycle themselves back into the fray after being tackled –– again and again and again. RUGBY PLAYERS MUST EARN THEIR POSITION EACH WEEK: Uncertainty is both uncomfortable and motivating. Rugby players know their selection to the first XV team each week depends on coach/captain assessments of their previous performance/stats. Salespeople and business owners understand this full well. They wake up everyday unemployed until face-to-face with customers. RUGBY PLAYERS KNOW THEIR POSITION COULD CHANGE AT ANYTIME: Rugby players may be assigned to different positions at a moment’s notice, especially if a teammate is injured. As it should be inside any company, cross training is mandatory in rugby –– and prima donnas are cut from the squad. Start-ups, distressed turnarounds and managers looking to develop über-talented staff should remain on lookout for CVs that include rugby-playing experience. RUGBY PLAYERS DO NOT HOLD GRUDGES: Every workplace, political campaign and boardroom has trials, tribulations and tensions. The culture of rugby offers an insightful solution to parlay: after every rugby match, opposing teams (often dressed in tie and blazer) have dinner and a few beers together. Why? All bad blood from the match is left on the field. In fact, opposing players often become great friends and career associates. Unheard of in soccer and American football cultures, this sportsmanlike ritual is a major reason the culture and character of rugby is emerging mainstream. RUGBY PLAYERS ARE BOTH HUMBLE AND PATRIOTIC: Christopher Liddell likely cringed at the headline referring to him as a rugby star. ”Not for glory nor for riches but for honour alone” is a popular banner waved at rugby matches, because the culture and character of rugby closely resembles the spirit of amateur sport. Being selected to play rugby for your country is the ultimate accomplishment. It is no wonder then, for all these reasons above, when international rugby teams line up shoulder-to-shoulder to belt out their national anthems together, the look in their eyes (and the tears down their faces) are indicative of the physical and mental preparation parlayed into their careers off the field. Why do the Howlers focus on Sevens Rugby? Sevens rugby is taking hold across the world. The Howlers have embraced the game of Sevens as a global game that has the potential to unite people through sport. We will not forget the 15's game, however the Howlers focus is truly on Sevens.